The numbers of people who have been forced to leave their homes throughout the world are staggering and growing—imagine the entire population of the United Kingdom or half the population of Mexico having to leave their homeland. How do we begin to understand what that means? While the scope of this global crisis may seem incomprehensible and the solutions beyond our reach, at the heart of the crisis are individuals trying to survive to keep their families together, and to find safe landing. In this seven-part series, we look at the stories of those who have sought refuge and those who have entered into their lives to offer help and support. This story is Part-two of the Place of Refuge series. Click here to view additional stories. Two volunteers, one a college student, the other a small business owner, accompany me on one of the church’s twenty-five-passenger buses to make a late-night trek to Sacramento International Airport. At the terminal, we enjoy conversation with staff from World Relief, the resettlement agency we have been partnering with for eight years, as well as volunteers from other local churches. We are gathered to welcome several families arriving from Afghanistan. They hold Special Immigration Visas (SIVs) due to a family member’s work experience with US forces on the ground in Afghanistan. Their cooperation with Americans has resulted in their becoming targets for opposing forces. Technically, that means they are not designated as refugees. The plane is delayed half an hour, making the families’ two-day journey that much longer. We wait at the bottom of the escalator, several of us holding signs with last names printed in large letters to help our new neighbors know who to approach as they arrive in their new hometown. Our church, River City Christian, a Covenant congregation, is welcoming a family of ten, the largest group arriving that night. Passengers from the in-bound flight from Los Angeles make their way toward baggage claim, some in business attire, some wearing the casual clothing typical of the West Coast. In the back of the crowd, another group cautiously emerges—almost all the women are wearing hijabs and the children look overwhelmed by fatigue and perhaps fear of the unknown. I greet a man who has spotted his family name on my sign with a hearty “Salam alaikum” or “Peace be upon you.” His name is Noor, and his proficient English reveals that he must have spent a great deal of time with Americans. His oldest son, who is twenty-one, also immediately engages in conversation, using language skills he had learned in Afghanistan. Noor’s wife, Bibi, and her seven other children only speak Pashto and nervously nod in response to my greetings. We all approach the baggage carousel, awaiting the twenty suitcases in which the family has carried their possessions from their homeland—mostly clothes but also photographs, a tea set, a green-covered Qur’an with gold engraving, and a few family heirlooms. While I am glad to have two younger male volunteers to help load the heavy suitcases onto the back seats of the bus, I imagine how difficult it must be to start a new life in a new country with so relatively few things to call their own. I imagine how difficult it must be to start a new life in a new country with so relatively few things to call their own. We arrive at their new apartment in a neighborhood of South Sacramento known for its low-income residents as well as high gang activity and crime. I wonder if the promise of coming to America, the so-called land of opportunity, will prove to be a disappointment for my new friends. It’s nearly midnight when we unlock the door to a unit originally designed as a two-bedroom but now has an addition of a poorly constructed dormitory holding six bunk beds. The condition of the complex is one of the worst I have seen in my years of helping refugees resettle here. I assure Noor that this housing arrangement was due to the large size of their family and the short notice of their arrival. It will be temporary. In the next few weeks, volunteers from the church, along with the family’s caseworker, help them move to a more adequate apartment, fill out necessary documents for food stamps and cash aid, enroll the children in school, introduce them to American grocery store shopping, share a meal at a local Muslim-owned Mediterranean restaurant, deliver a couple of bikes for the children, and answer questions about life in Sacramento. Noor wants his wife and their twenty-one-year old daughter to learn English, but he is hesitant about them leaving the apartment complex unaccompanied. In his mind, doing so would communicate to their neighbors that they are not a very respectful, upstanding family. Neither Bibi nor their daughter has ever attended school or learned to read or write in any language. I ask one of our volunteers at church if she would consider teaching the two women English in their home. Together she and I visit the apartment, and she offers our hosts a freshly baked apple pie. None of the family knows how to slice it or the “proper” protocol of how to consume it, but the smiles and bilingual conversation that follow predict that new friendships are forming. River City Christian, a Covenant Congregation in Sacramento, California. Sacramento has received thousands of refugees and SIV holders in the last several years. 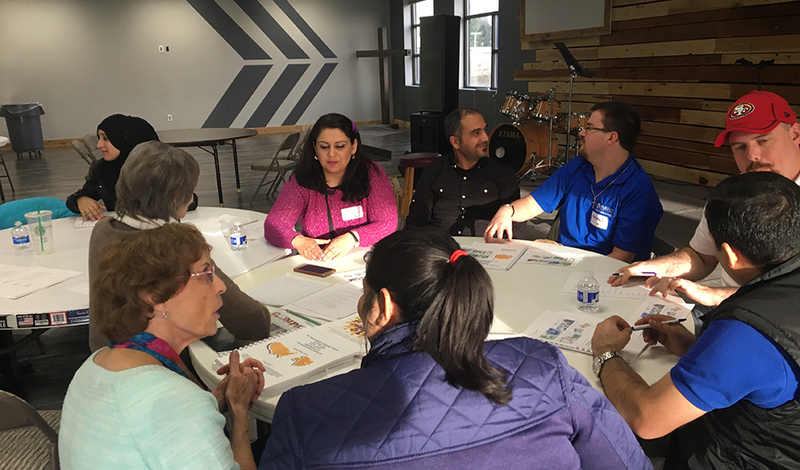 Our congregation has been honored to serve hundreds of these new neighbors, concentrating mostly on those arriving from Iraq and Afghanistan. We have hosted “Bridges” meetings with cross-cultural potlucks and picnics and barbecues, ESL classes, job search assistance, youth group activities and discussions, children’s programs with Bible lessons and crafts, soccer games, and special presentations on how to thrive in a new culture. Many of our refugee friends have also participated in special events sponsored by the church, including our annual Harvest Carnival, men’s conference, and youth retreats. Our Christmas Mall, a free holiday shopping experience accompanied by a salon and spa, a meal and entertainment, children’s activities and family crafts, is popular for our Iraqi and Afghan friends. Of the 1,000 people in need in our community who participated in December, around 350 were refugees or SIV holders. The investment in the immigrant community has had an amazing impact on our church. It is not unusual for Muslim families, the women almost always covering their heads, to attend Sunday morning worship services with us. Volunteers and immigrants share meals and take fun day trips together. Spiritual conversations and informal Bible studies are a frequent result of these growing friendships. A few have expressed faith in Christ. Our congregation is committed to being a mission station as opposed to being a country club. Sacramento is a diverse city, but refugees have not always been embraced by the Christian community. We believe Jesus calls us to change that. He commands us to love our neighbor, including those recently relocated from Iraq and Afghanistan. We are simply trying to obey.